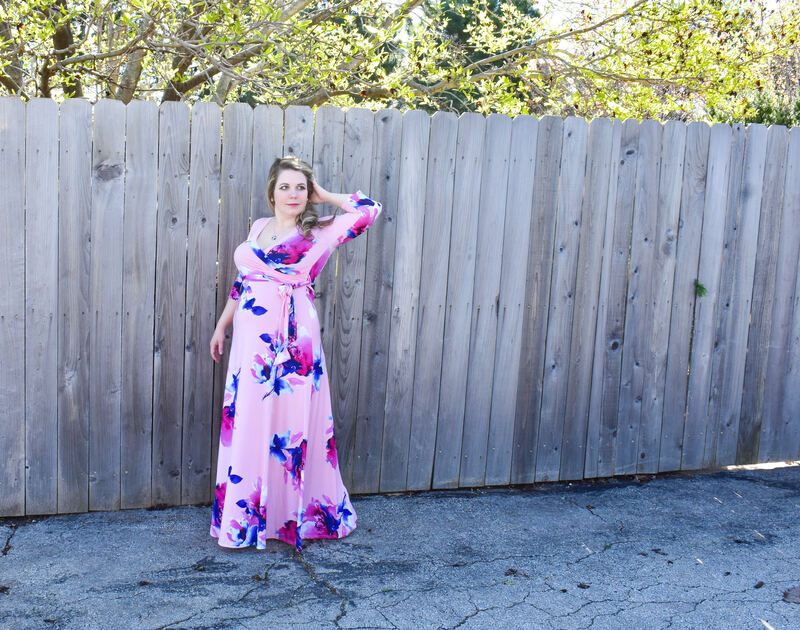 In these photos, I’m wearing the Peach Floral Abstract Wrap Maternity/Nursing Maxi Dress. The gorgeous floral pattern and luxurious fabric make me feel beautiful in this dress. But most importantly, this dress is amazingly comfortable! And as any mom can attest, comfort is key during pregnancy. Especially during a summer pregnancy, which I’m a little nervous about. I’m kind of a baby about the heat even when I’m not pregnant. Bring on all the dresses! And air conditioning. Lots of air conditioning. 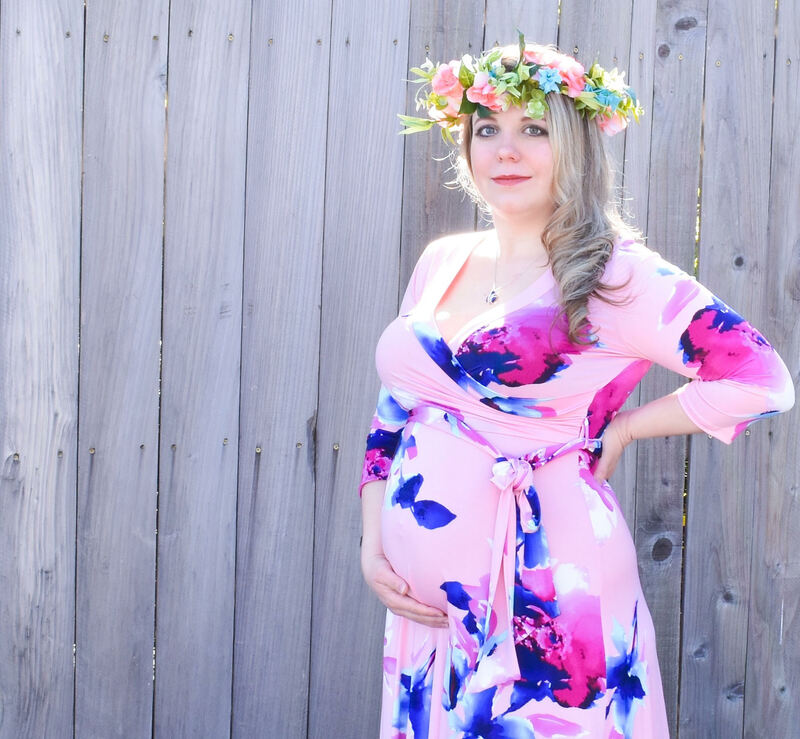 I love how this dress will transition to the “4th trimester” (and beyond!) as well. I struggled to find nursing-friendly clothes after my son was born, so I was immediately impressed with how easy it will be to breastfeed in this dress. PinkBlush offers several dresses in this same nursing-friendly style, so you can easily find a pattern (or several!) that you’ll love. After Colton’s birth, I mainly lived in nursing tanks (for an embarassingly long time). We had a couple of weddings to attend when he was about 6 months old, and I remember panicking that I couldn’t find anything nice to wear that would 1) allow me to nurse and 2) be flattering to my postpartum body. I’m excited to have this dress in my closet now so I won’t have to stress about dressing for nice events after Baby #2 is here! Any woman knows that accessories make the outfit. 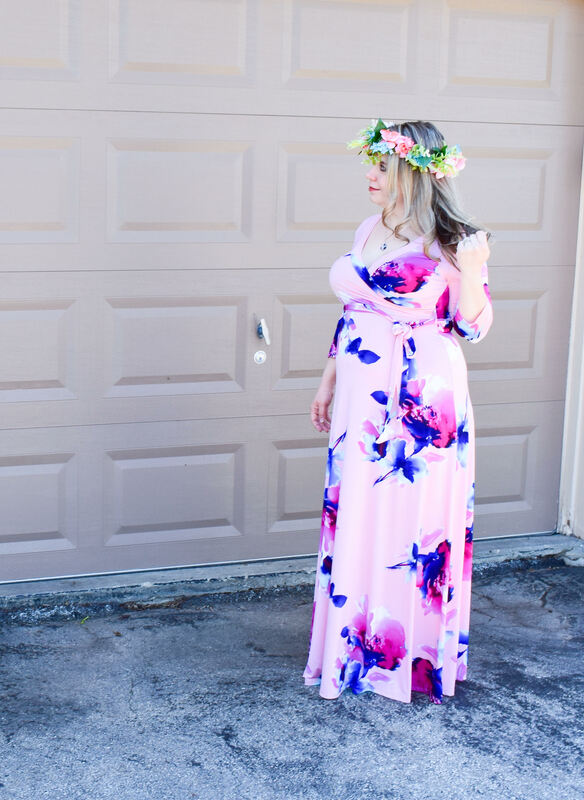 I accessorized my PinkBlush Maternity dress with a flower crown and a bright blue heart pendant. I made the flower crown myself! It was my first one and I’m really happy with how it turned out. I’ll be posting a tutorial soon. They’re super easy to make and don’t take much time at all! My husband gave me the beautiful blue heart necklace for Christmas. It’s gorgeous, but I honestly don’t wear it too often as I don’t have a lot of things in my closet that it coordinates with. I was so excited when I realized it was the perfect blue to match the floral pattern on my PinkBlush dress! Random fact, my husband (then boyfriend) gave me diamond studs for our first Valentine’s Day… way back in 2005! I’ve worn them every day since. I don’t know what I’d do if I lost them. I’m a little surprised I haven’t, to be honest. I have a horrible track record of losing jewelry. 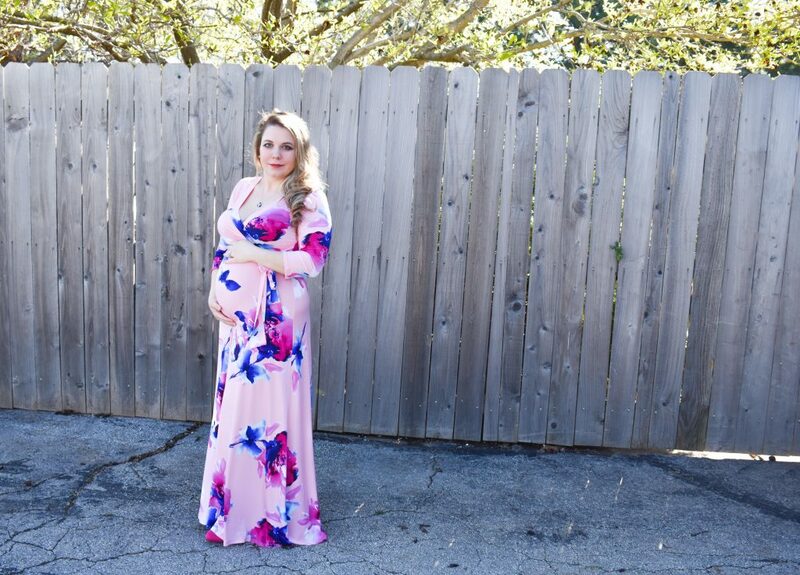 I’m so happy with this dress from PinkBlush Maternity! The style, the fit, and the pattern are all on point. 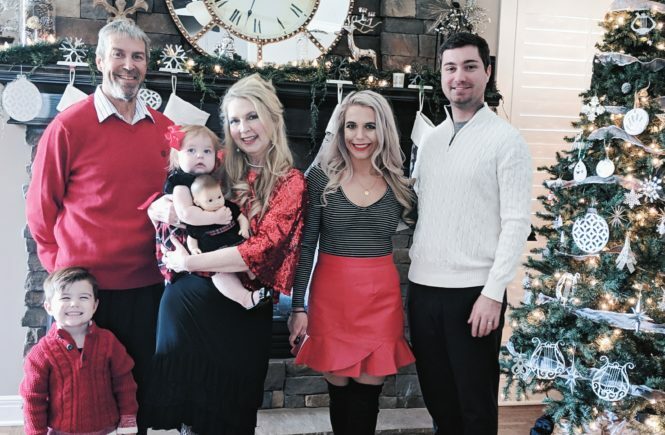 PinkBlush has a ton of pregnancy clothes to choose from, and I’m so excited to offer you a chance to win a $75 gift card to select some cute maternity clothes for yourself! Don’t forget to pin this look! Want more maternity style inspiration? Check out my previous pregnancy fashion posts on second trimester style and maternity workout clothes. Like giveaways? Enter to win a Gifted movie prize pack or a hardcover copy of I’m Going to Give You a Bear Hug! That’s a great choice, Dagmar! I love that one too. In fact, I almost selected it to wear for this post! 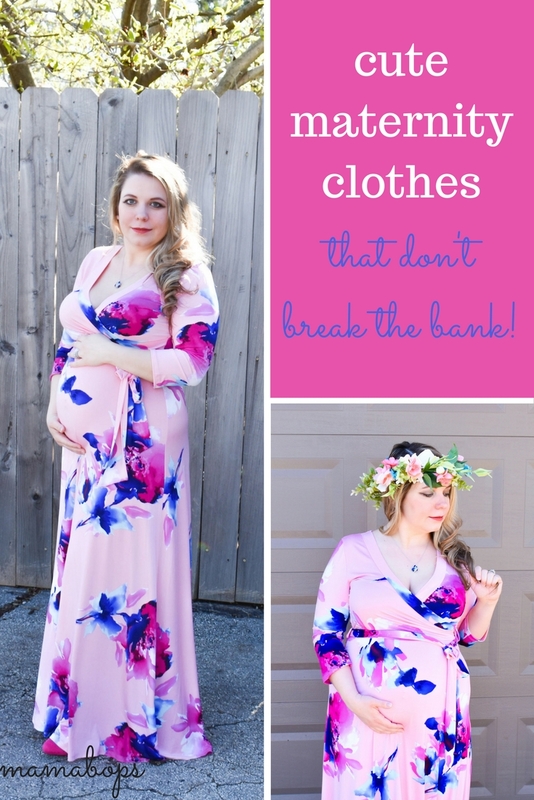 I love the Navy Floral V Neck Wrap Maternity Dress. Thanks for the giveaway! I love the floral patterns too! Good luck in the giveaway! I love the design on that one, Heather! I might have to get it for myself! I love that pinkblush has plus sizes also! I love all the maxi dresses. Me too, Michelle! I have a feeling I’m going to be wearing a lot of maxi dresses this summer! Yes, I love navy! Great pick, Jesi! I LOVE the Navy Cold Shoulder Maxi Dress!!! So super cute and perfect for Summer!! Great choice, Amber! I’m loving cold shoulders this season! I love that one too, Ashley! I love the floral patterns! I think I would choose the White Floral Maxi Dress. It is a hard choice. So many cute things. I agree, Anita! So many great choices! I would get the Ivory Floral Pleated Maternity Dress. That one is beautiful! Great pick, Julie! Thank you, Mica! 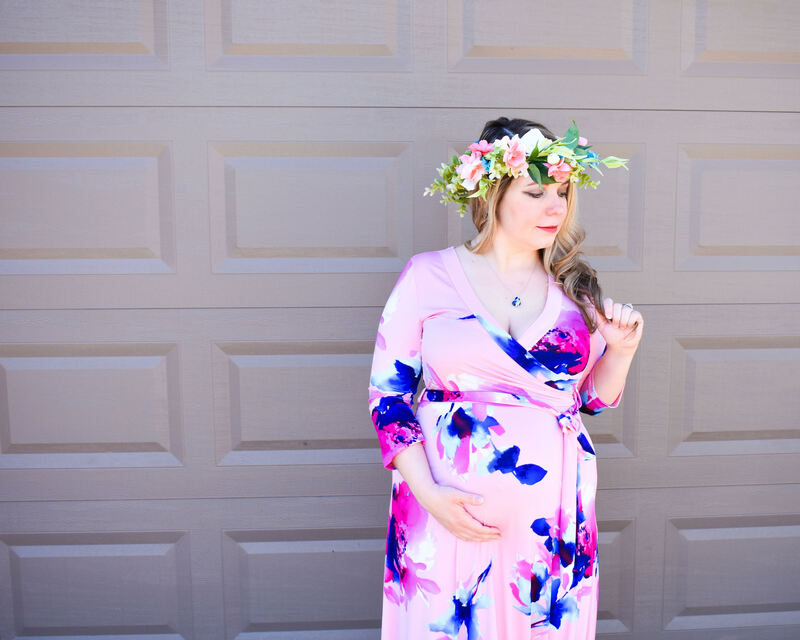 Wrap dresses are so great for pregnancy and nursing! I like the Blue Abstract Wrap Front Maternity Tankini Top. I live in florida and am due in september. I am going to need a maternity swimsuit! I’ve been thinking about a maternity swimsuit, too. You’ll definitely need one in Florida! You look AWESOME! I am always looking for cute maternity clothes. 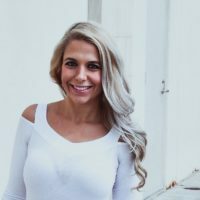 I am not currently pregnant, but it could happen soon so I am bookmarking this post so I know which clothes I want to add to my closet! Thank you, Ashlyn! Good luck with trying to conceive. Hope it happens quickly for you! Absolutely stunning. Brilliant colors and print and gorrrgeous you!! Aww, thank you! I really appreciate that! That is very sweet, Melissa! Thanks for your kind words! I love that this dress is nursing friendly! You look great, mama! Thanks so much, Logan! I’m glad to have a nursing-friendly dress in my closet. Sadly, they’re hard to come by! Thank you, Jasmine! That is so sweet of you! I really like the Black Faux Leather Bag. And they have a fab selection of sandals. You can’t go wrong with a classic black bag! Oh, this is such a pretty dress! You look so radiant in it and your beautiful flower crown. 🙂 Thanks so much for linking up with Fabulous Friday! I love the Black Chevron Dress! Thank you! That lace is gorgeous! Love it! Beautiful dress! I also like the Black Floral Sash Tie Dress. Thank you, Dana! I love the floral designs! I love the Coral Short Plus Dress! Coral is so in right now! That’s a great pick, Tracie! http://www.pinkblushmaternity.com/p-26297-grey-laser-cut-bowtie-flat.aspx?DepartmentID=7 I love these shoes! I love those too, Lee! I especially like the little bow detail. Great find! You can’t go wrong with a black dress! I would love to get the Burgundy Lace Dress! Thanks for another awesome giveaway! I’m loving lace right now! That’s a great choice, Angela! I totally understand, Lisa! When I’m pregnant, I’m ready to meet the baby… then when Baby is here, I miss being pregnant! One item I really like is the Light Blue Polka Dot Button Down Sash Tie Dress. But they have so many cute things. Is this just for the maternity or is it for maternity or women’s ? I really like button down dresses! Great choice, Christy! I agree, they have a lot of great options! It’s hard to pick just one! I would choose the Navy Floral Sash Tie Maternity/Nursing Maxi Dress. It is so pretty and looks so comfortable. That one is gorgeous! I’m sure it is super comfortable, too! I’m loving blue this season! That’s a great choice, Crissie! Floral is so in this year! I’m loving it! What a cute dress! I’m not familiar with PinkBlush – I need to check them out! I recently gave up on wearing most of my “normal” pants and shorts now that I’m in my second trimester. I had to give up most of my normal clothes around that same time. 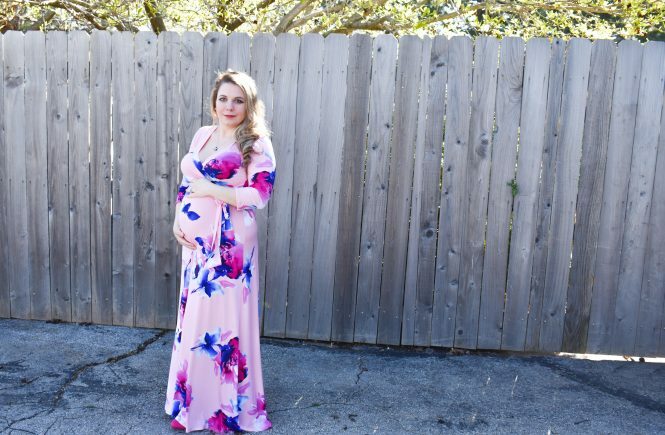 PinkBlush is a great source for maternity clothes! They have a lot of cute and affordable items!